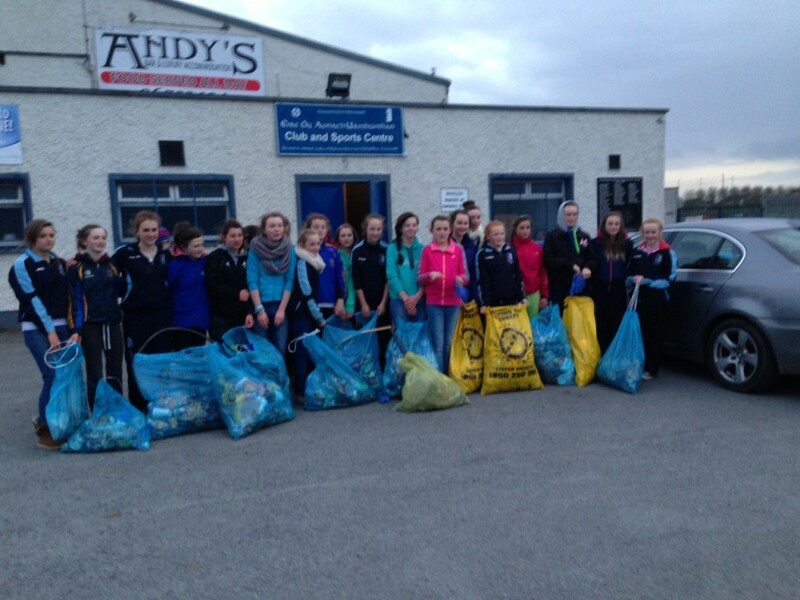 The combined Éire Óg senior, juvenile & Camogie weekly club notes. MacDonagh Park, Nenagh after Sunday’s senior double header. Senior hurling: on Sunday afternoon last in Dolla our senior hurlers kept their unbeaten start to the championship intact following a six-point win over Kilruane. The final score was 0-21 to 0-16. We now have a bye in round four while our final group game will be against Portroe. Junior A hurling league: our Junior A team continue their league campaign against Knockshegowna this Thursday at 7.30pm in Ballingarry. Junior B hurling league: round three of the junior B league takes place this Friday against Silvermines. This game takes place at 7pm in Dolla. Inter-county: best wishes to Michael Heffernan and the Tipperary team this Sunday in the Allianz National League final at Nowlan Park, Kilkenny. Parish League: The Éire Óg Parish League continued last Monday with another excellent turnout of players and families in attendance. There was a second win for Red Rovers over St Mary’s (8-2 to 6-3) in an exciting game. Ben West, Dylan Murphy and Maeve Hassett were among the best displays for the winners with Jason Teefy, Cameron Spillane and Cian Griffin shining out for St Mary’s. In the second game Sarsfields had their first win by defeating Éire Óg (4-1 to 1-4). Mark Ryan, Lucy Spain, Megan Morris and Josh Keller had good displays. Red Rovers look good for the A final with four points and now play Éire Óg who are looking for their first win. The winner of Sarsfields and St Mary’s will make it to the A final, both have two points. Round three is on Monday, May 29th with players scheduled to meet at 6pm and all support is welcome. Under-8: our under-8 team had their first match of the season away to the Silvermines on Thursday evening last. For some of our new players it was their first ever match. A great time was had by all. Our thanks go to the Silvermines. Under-10 & Community Games: the Community games team had a challenge match against Borris-Ileigh last Thursday following on from Sunday’s game against Carrig-Riverstown. The boys are training hard and playing well. Keep up the good attendance lads. Under-12: groups one and four are through to the semi-final stages of the under-12 football league. Both teams have unbeaten runs thus far. We wish them the best of luck in the semis. Under-14: the fourth and final round of the under-14 football league will take place on Wednesday, May 1st. Nenagh, who have three wins out of three, are away to a strong Inane Rovers team. Under-16: our under-16 team lost out in their final football league match to Inane Rovers on Monday evening last. Nenagh contested well and can take a lot of positives from the game, but a strong finish from the opposition ended the lads’ league challenge for this year. Dates for the diary: the juvenile summer camp will be held from July 22nd-26th this year. It’s always a very successful and enjoyable camp for girls and boys. We hope to see you there. Congratulations: we offer our congratulations to the Éire Óg players who featured strongly in last week’s Fitzgerald Cup final and in the recent Garda Cup. In the Fitzgerald Cup final (Tipperary under-17A colleges hurling) Nenagh CBS beat Our Lady’s Templemore 4-15 to 0-7 at Dolla. Nenagh CBS led 1-5 to 0-6 at the break. Nenagh CBS: Paul Carroll (Burgess), Gavin O’Connor (Nenagh Éire Óg), Mark Grace (Toomevara), Conor Ryan (Nenagh Éire Óg), Eamonn Corcoran (Silvermines), Andrew Coffey (Nenagh Éire Óg, 0-1, 0-1 free), Stephen Ryan (Silvermines), Philip Hickey (Nenagh Éire Óg, 0-1), Adam Cody (Burgess, 0-1), Cormac Keating (Portroe, 0-1), Darragh Peters (Kilruane MacDonagh’s, 1-5, 1-0 penalty), Aodhán Geaney (Nenagh Éire Óg), Andrew Dunne (Burgess, 3-2), Shane Hennessy (Nenagh Éire Óg, 0-2), Michael Brislane (Toomevara, 0-1). Subs: Keith Nealon (Burgess) for Shane Hennessy, John Kennedy (Templederry Kenyons, 0-1) for Michael Brislane, Conor Gill (Burgess) for Cormac Keating, James Quigley (Kildangan) for Adam Cody. Meanwhile Shane Hennessy captained North Tipperary to a third successive Garda Cup (under-16 inter-divisional hurling) title. North Tipperary beat South Tipperary in the final at Templetuohy. In their semi-final North Tipperary beat West Tipperary 3-15 to 0-8. North Tipperary won the final 0-16 to 0-6. The North Tipperary team are managed by Ken Dunne, Len Gaynor and John Sheedy and will travel to Killeagh (Cork) on May 4th for the group stages of the Munster inter-divisional under-16 championships. North Tipperary will be chasing an historic three Munster titles in-a-row, a feat no division has ever achieved. North Tipperary: Paul Carroll (Burgess), Cormac Keating (Portroe), Eoin Stapleton (Borris-Ileigh), Gavin O’Connor (Nenagh Éire Óg), Craig McGrath (Borrisokane), Darragh Peters (Kilruane MacDonagh’s, 0-1), Michael Brislane (Toomevara, 0-2 ‘65s), James Cleary (Kilruane MacDonagh’s, 0-1), Michael Gohery (Borrisokane, 0-1), Gary Ryan (Borrisokane, 0-2), Shane Hennessy (Nenagh Éire Óg, captain, 0-2), Conor Gill (Burgess, 0-1), Jack Delaney (Toomevara, 0-3, 0-2 frees), Darragh Carey (Templederry, 0-3), Daniel Carew (Newport). Well done to all the Éire Óg players involved in both competitions! Under-12: our under-12s played the fourth round of the championship in Nenagh last Tuesday against Newport winning on a scoreline of 1-5 to 1-1. Next up are our neighbours Burgess when we face them on Tuesday in Kilcolman. The semi-finals of this competition are due to take place on May 5th-6th. Under-14: our under-14s have qualified for the All-Ireland Féile na nGael finals next July in Limerick. This is a fantastic achievement as they are the first Camogie team from the town to reach this stage of the competition. We have established a sub-committee charged with the task of raising vital funds to help meet the costs of this venture. If you would like to contribute, as a business or private donation, please contact Noel Coffey or any member of the committee. Under-16: our under-16s played Kilruane MacDonagh’s in the third round of the championship in Nenagh where they held on for a four-point win. The girls have now completed a hat-trick of victories. As the junior certificate exams loom these girls won’t feature again until the end of June. Junior B: our junior B team are due to face Kilruane MacDonagh’s on Bank Holiday Monday in the league semi-final. This is only the second time in our history that we have reached this stage of the competition with Silvermines providing the opposition in 2011. Unfortunately, despite a great effort that day, we just fell short at the line. This time however we aim to go at least one step further and make the final. Details of the fixture will be posted on our Facebook page (www.facebook.com/nenagheireog) and on the main club website, www.nenagheireog.com. Éire Óg recovered a five-point interval deficit (0-5 to 0-10) to record a six-point win over Kilruane MacDonagh’s at Dolla this afternoon. Kilruane started well and led 0-3 to no-score before a Kevin Tucker free got Éire Óg off the mark in the tenth minute. Two points from Michael Heffernan and another Kevin Tucker free left just one point between them (0-4 to 0-5) by the 20th minute, but Kilruane closed out the opening half in impressive fashion with five points establishing a 0-10 to 0-5 interval lead. Thanks to a series of points from Killian Gleeson (2), Michael Heffernan (2), Alan Kelly, Tommy Heffernan (2) and Hugh Maloney Éire Óg reduced the deficit to a single point by the 45th minute (0-12 to 0-13) before a Donnacha Quinn free levelled it up. A Paddy Murphy point in the 47th minute presented Éire Óg with the lead for the first time before points from Tommy Heffernan, Killian Gleeson and Michael Heffernan (2) helped the Blues into a 0-18 to 0-13 lead. Kilruane made a late stand and closed the gap to four points (0-19 to 0-15), but Éire Óg saw out the game with efforts from Tommy Heffernan and Hugh Maloney. The result propels Éire Óg to the summit of group three – Éire Óg (five points), Portroe (three), Kilruane MacDonagh’s (two), Kildangan (one) & Moneygall (one). Éire Óg have a bye in the next round while Kilruane MacDonagh’s face Portroe and Moneygall take on Kildangan. The final round of games will see Éire Óg face defending north champions Portroe and Kildangan clash with Kilruane MacDonagh’s. Meanwhile Roscrea have claimed top spot in group one. Silvermines are also through to the quarter-finals while Toomevara will face Lorrha in a play-off for a quarter-final spot on the week-ending May 12th. Templederry won group two on scoring difference ahead of Borris-Ileigh while Burgess and Borrisokane have been eliminated from the 2013 north Tipperary senior hurling championship. Nenagh Éire Óg: Michael McNamara, Mark Flannery, Noel Maloney (captain), John Brennan, Daire Quinn, Barry Heffernan (0-1, 0-1 free), Billy Heffernan, Alan Kelly (0-1), Pearse Morris, Kevin Tucker (0-2, 0-2 frees), Paddy Murphy (0-2), Tommy Heffernan (0-3), Killian Gleeson (0-3), Michael Heffernan (0-6), Donnacha Quinn (0-1, 0-1 free). Subs: (6th) Adam Grattan for Mark Flannery, (HT) Hugh Maloney (0-2) for Kevin Tucker, (59th) Seán Geaney for Pearse Morris, (63rd) James Mackey for Donnacha Quinn. The Éire Óg Parish League continued last Monday with another excellent turnout of players and families in attendance. There was a second win for Red Rovers over St Mary’s (8-2 to 6-3) in an exciting game. Ben West, Dylan Murphy and Maeve Hassett were among the best displays for the winners with Jason Teefy, Cameron Spillane and Cian Griffin shining out for St Mary’s. In the second game Sarsfields had their first win by defeating Éire Óg (4-1 to 1-4). Mark Ryan, Lucy Spain, Megan Morris and Josh Keller had good displays. Red Rovers look good for the A final with four points and now play Éire Óg who are looking for their first win. The winner of Sarsfields and St Mary’s will make it to the A final, both have two points. Round three is on Monday, May 29th with players scheduled to meet at 6pm and all support is welcome. Senior, juvenile, handball and Camogie notes combined. Senior hurling championship: on Sunday afternoon next our senior hurlers return to championship action when they take on Kilruane MacDonagh’s in the third group game. This game takes place in Dolla at 1.30pm. Junior A hurling league: on Saturday evening last our junior A team made it two wins from two with an eight-point win over Kildangan. The final score was 2-18 to 2-10. Congratulations: congratulations to Paul O’Leary who was a member of the Tipperary minor football panel which beat Clare in a Munster quarter-final at Ennis on Saturday afternoon. Meanwhile on Sunday Michael Heffernan scored a goal in Tipperary’s comprehensive victory over Dublin in the National Hurling League semi-final at Semple Stadium. Under-6 & under-8: training for the under-6 and under-8s continues on Wednesdays at 5.15pm and on Saturdays at 10am. Under-10 & Community Games: training is in full swing now and with challenge matches planned full attendance is required. Under-12: the under-12 group one footballers recorded a three-point win over Borrisokane on Friday last. In a high scoring encounter goalkeeper Conor Malone made a string of fine saves while there were also strong performances from Gavin Dooley, Brendan Long and Liam Heffernan. 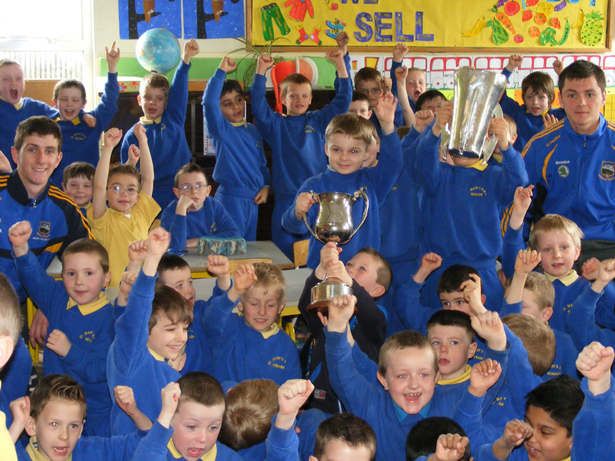 Our group one and four teams are away to Kildangan next Friday, April 26th. Under-14: in terrible conditions Nenagh played their third round football league match at home to Kildangan on Wednesday evening last. Against the gale in the first half Nenagh regrouped after early Kildangan pressure to lead 3-5 to 1-3 at half-time. Aided by the wind in the second half Nenagh wasted no time putting some distance between the teams with three early second half goals. Éire Óg ran out convincing winners on a final scoreline of 9-12 to 1-3. A special mention must go to Evan Murphy for his strong defensive performance and to youngest player Barry Coffey for some great goals. Nenagh receive a bye in the next round. Under-16: our round four football match last week against Kilruane was cancelled. Garda Cup: well done to North Tipperary under-16s who won the Garda Cup in Templetouhy on Saturday last defeating West Tipperary in their semi-final and South Tipperary in the final. Éire Óg was represented on the North Tipperary team by Gavin O’Connor and Shane Hennessy who also captained the team. North Tipperary now go forward to compete in the Munster championship, a title which the division won last year. Incidentally previous Éire Óg men who captained successful North Tipperary teams in the Garda cup were: Fergal Hynes (1989), Darragh Quinn (1993), Mark Flannery (2006), Tommy Heffernan (2008) and Killian Gleeson (2011). Parish League: The first round of the Parish League took place on Monday, April 18th with a very good turnout of players. The Geaney family donated two cups in honour of their late father, Michael Geaney senior. These cups will be played for in the A and B finals in a few weeks’ time. The results of the first games were: St Mary’s 3-5 Éire Óg 3-4, Red Rovers 2-8 Sarsfields 2-4. Among the younger players there were great displays from Dermot McTiernan, Maeve Hassett, Ben West, Katie Morris, Adam Ryan, Laura White, Jamie Cottrell, Dylan Noonan-Kelly and Cian Galvin. A special mention must also go to Sean Phelan who scored points from two sideline cuts. The league continues on Mondays – the players are scheduled to meet at 6pm. Congratulations to Sinéad Maher who was the only Tipperary representative on the Munster team which won the inter-provincial handball title recently in Cavan. Sinéad won her two games in the competition. Well done also to Katie Morris, Eoin Meagher, Sinéad Meagher and Eimear Meagher who all played very well in the national juvenile championships at the weekend. The junior B team received a walkover from Fethard in the league and as such have finished the group stage unbeaten. Éire Óg are now through to the semi-finals which are scheduled to take place in The Ragg on May 5th. The under-14s enjoyed a great win over Toomevara on Tuesday last (4-4 to 2-0) in the championship. The under-12s beat Drom & Inch on Saturday. Well done girls and keep up the great work. The under-14 face Newport on Tuesday while the under-16s are playing Newport on Thursday in MacDonagh Park, Nenagh. Best wishes ladies. The under-16s defeated Kilruane MacDonagh’s in the championship (5-7 to 0-2) on Wednesday last with Julie Moylan going on a scoring spree bagging a personal total of 4-1. Team: Sarah Quigley, Cara Mulqueen, Rachel Maher, Anna Dillon, Rachel Spillane, Hazel McAuliffe, Maeve Coffey, Michelle Collins (0-1), Elaine Slattery, Hazel Coffey, Aishling O’Brien (0-1), Alicia Hallinan, Grace O’Brien (1-2), Sarah O’Connor (0-2), Julie Moylan (4-1), Mairéad Sheridan, Lisa Darcy, Clodagh Ryan, Saoirse Griffen. Hard luck to Aileen Duggan, Alanna Morris and the Tipperary under-18s who were defeated in the All-Ireland semi-final by Cork on Saturday last. The under-14 team have qualified for the All-Ireland Féile na nGael finals to be played next July in Limerick. This is the first time a Camogie team from the town has qualified for this competition. Unfortunately this comes with a huge price and the club will be seeking sponsorship for this event. All donations from private individuals and businesses will be gratefully accepted and we will be establishing a sub-committee shortly to organise fund raising. If you wish to donate please contact any member of the committee. Éire Óg recorded an impressive 2-18 to 2-10 win over Kildangan at Puckane in the junior A hurling league on Saturday evening. Goals from James Mackey and Andrew Coffey helped Éire Óg into a 2-12 to 0-3 interval lead. Nenagh Éire Óg: Willie Bolger, Donnacha Heffernan, John O’Donoghue, Michael Collins, Niall Madden, Niall Cahill, Eoin Fitzgibbon, Pearse Morris, Brian Maxwell (0-2), Adam Grattan (0-2), David Hackett (0-9, 0-8 frees), Andrew Coffey (1-0), James Mackey (1-2), Brian Quinn (0-1), Darragh Walsh (0-2). Subs: Philip Hickey for Pearse Morris, Conor Ryan for James Mackey, Kevin Flynn for Willie Bolger, Ger O’Gorman for Michael Collins, Willie Bolger for Andrew Coffey. There was a fantastic turn out for the first round of the under-12 parish league which took place on Monday, April 18th. The Geaney family donated two cups in honour of their late father, Michael Geaney senior – these cups will be played for in the A and B finals in a few weeks’ time. The results of the first round games were: St Mary’s 3-5 Éire Óg 3-4, Red Rovers 2-8 Sarsfields 2-4. Amongst the younger players there were great displays from Dermot McTiernan, Maeve Hassett, Ben West, Katie Morris, Adam Ryan, Laura White, Jamie Cottrell, Dylan Noonan-Kelly and Cian Galvin. A special mention goes to Seán Phelan who scored points from two sideline cuts. The league continues next week – players will be notified of the time. Éire Óg: Barry Coffey, Brendan Long, Eoin Tinkler, Jamie Cottrell, Mark Ryan, Dylan Noonan-Kelly, Lucy Spain, Clara McGrath, Siobhán Collins, Orla Sheridan, Sadhbh Shoer & Anna Mai Clancy. St Mary’s: Conor Hennessy, Gavin Dooley, Cian Griffin, Cameron Spillane, Adam Ryan, Jason Teefy, Laura White, Lily O’Brien, Eva McKeogh, Anita McCloone, Caitlin McCabe & Keela O’Brien. Sarsfields: Rory O’Donovan, Seán Phelan, Conor Malone, Josh Keller, Cian Galvin, Conor White, Danny Wilkinson, Sine Morris, Megan Morris, Crona Cantwell, Grace O’Flaherty, Katie Morris & Sean Richardson. Red Rovers: Cian O’Farrell, Liam Heffernan, Conor Robinson, Ben West, Dylan Murphy, Paul White, Maeve Hassett, Megan Grace, Ellie Spain, Sarah Hallinan, Abbie Sheedy, Eva Lawlor & Dermot McTiernan. Senior Hurling: on Sunday evening last our senior hurlers defeated Moneygall comfortably in round two of the championship. The final score was 5-12 to 0-9. Round three is scheduled to take place on the weekend of April 26th against Kilruane MacDonagh’s. Junior A Hurling League: our junior A team play Kildangan in the second league game this Saturday evening at 6.30pm in Puckane. Inter-County: best wishes to Paul O’Leary and the Tipperary minor footballers as they take on Clare in Ennis this Saturday at 7pm in a Munster quarter-final. Under-10 & Community Games: Challenge match on Wednesday, April 17th at 6.45pm in Borrisoleigh – players to meet at the field at 5.30pm. Under-12: the under-12 groups one and four footballers both recorded their second victories on the trot with wins over Toomevara on Friday last. In the group one game Éire Óg were lucky to hold on for a 2-6 to 2-5 win after a strong Toome comeback in the second half. The group four team enjoyed a more convincing 4-2 to 1-1 victory. The group one team are at home to Borrisokane on Friday, April 19th while the group four team has a bye. Hurling training continues on Wednesdays at 6.15pm and on Saturdays at 10.45am. Under-14: our under-14 footballers had a good win in Borrisokane on Wednesday last in their second match in the football league. A strong team-performance, which included two goals from Killian Malone and great goalkeeping by Aaron White, saw them run in at half-time with a 2-3 to 0-1 point lead. It was inevitable that a strong Borrisokane team would throw everything at us in the second half and two early goals narrowed the gap to two points. Nenagh however stuck to the game plan, led by a tireless performance by Fiachra Carey, to run out winners on a 4-4 to 2-1 scoreline. The next round match is on Wednesday, April 17th at home to Kildangan. Under-16: the under-16 footballers game against Kilruane MacDonagh’s on Monday evening was postponed. Their next match in the league is on Monday, April 22nd at home to Inane Rovers. This team is putting in a huge effort in training and we wish the lads the best of luck in their upcoming matches. Tipperary minors: congratulations to Shane Hennessy, Barry Heffernan, James Mackey and Andrew Coffey on their success with the Tipperary minor hurling team last week. The junior B team maintained their great run in the league defeating Ballingarry on a scoreline of 5-8 to 1-1 on Sunday with Sarah O’Connor (2), Holly O’Brien and Danielle Harrington among the goal scorers. We have one game left in the league against Fethard. The under-14 team had a great win in the Féile na nGael final against Newport (2-6 to 0-2). This is the very first time we have ever won the Féile na nGael title and great credit is due to the team and their mentors for all their hard work. Hard luck to our under-12 team that was defeated by Toomevara. We offer our congratulations to Sinéad Meagher who was a member of the Munster team which won the inter-provincial title in Cavan on Saturday – Sinéad won both of her matches in the competition. Éire Óg scored five goals in an eighteen-point win over Moneygall at MacDonagh Park, Cloughjordan on Sunday evening. Éire Óg moved to the top of group three in the Hibernian Inn north Tipperary senior hurling championship thanks to an eighteen-point win over Moneygall at MacDonagh Park, Cloughjordan on Sunday evening. Moneygall initially took the lead before Éire Óg responded with a Killian Gleeson goal following good work from Donnacha Quinn. Moneygall led 0-5 to 1-1 when Éire Óg plundered a second goal in the 19th minute – this time Kevin Tucker kicked home following Tommy Heffernan’s well-flighted sideline ball. Three consecutive Tommy Heffernan points helped Éire Óg into a 2-4 to 0-5 advantage. A third Éire Óg goal, thanks to the efforts of Killian Gleeson, and two Kevin Tucker frees saw the Blues retire at the interval nursing a 3-6 to 0-5 lead. Points from Donnacha Quinn, Kevin Tucker (free) and Paddy Murphy left eleven points between them (3-9 to 0-8) before Tommy Murphy smacked home Éire Óg’s fourth goal in the 54th minute. Two minutes later James Mackey added the fifth before points from Paddy Murphy (two) and Andrew Coffey closed out the game. Éire Óg face Kilruane MacDonagh’s in third round – fixture details to be confirmed. Nenagh Éire Óg: Michael McNamara, Mark Flannery, Noel Maloney, John Brennan, Daire Quinn, Barry Heffernan, Billy Heffernan, Alan Kelly, Pearse Morris, Kevin Tucker (1-4, 0-4 frees), Paddy Murphy (0-3), Tommy Heffernan (1-3), Killian Gleeson (2-0), Michael Heffernan, Donnacha Quinn (0-1). Subs: (40th) Seán Geaney for Alan Kelly, (51st) James Mackey (1-0) for Killian Gleeson, (57th) Andrew Coffey (0-1) for Pearse Morris, (61st) Johnny Slattery for Kevin Tucker. Overall the weekend proved very encouraging for Éire Óg. Besides the seniors beating Moneygall on Sunday evening the junior B Camogie team recorded another great win in the league beating Ballingarry 5-8 to 1-1. The under-14 Camogie team also won the county Féile na nGael final at the Ragg on Saturday beating Newport 2-6 to 0-2 in the decider while we also offer our congratulations to Nenagh Handball Club’s Sinéad Meagher who was a member of the Munster team which won the inter-provincial title in Cavan on Saturday – Sinéad won both of her matches in the competition. Senior Hurling: on Saturday evening last our senior hurlers opened their championship campaign with a draw again Kildangan (final score: Éire Óg 0-17 Kildangan 1-14). Round two takes place on Sunday evening when Moneygall provide the opposition. This game takes place in Cloughjordan at 5.30pm. All support appreciated. Munster minor hurling championship: best wishes to Barry Heffernan, Shane Hennessey, Andrew Coffey and James Mackey who feature on the Tipperary minor hurling panel which takes on Waterford on Thursday evening in Walsh Park (7pm) in the first round of the championship. Parish League: under-12 Parish League starts on Monday, April 15th. This is open to all boys aged ten to 12 years of age – players are to be in the field at 6pm. Under-6 & under-8: training is on Wednesdays at 5.15pm and on Saturdays at 10am. New players welcome. Under-10: under-10 and Community Games training is now in full swing and with challenge matches planned – all players are requested to attend training. Under-12: our under-12 footballers had good wins in both groups one and four away to Kilruane MacDonagh’s on Friday last. There were strong performances all over the field for both of our teams and some excellent goalkeeping. The second round of matches is on Friday, April 12th at home to Toomevara for both groups. Keep up the good work. Under-14: the under-14 footballers kicked off the league with a good win over Kilruane in Nenagh last Wednesday on a score of 4-4 to 0-7. A strong defensive display provided a great platform for the team who play their next round match away to Borrisokane on Wednesday, April 10th at 6.30pm. The team and management wish a speedy recovery to Ethan O’Brien who was injured during the match. Under-16: the under-16 footballers received a bye into the second round of the league matches and will be in action next on Monday, April 15th (away to Kilruane MacDonagh’s). Well done to under-14 Evan Murphy who won the Puc Fada in the Féile Skills competition on Saturday last in Kilcolman. The juvenile club committee would like to wish the best of luck to Tipperary minors Shane, Barry, James and Andrew against Waterford on Thursday. Congratulations to Rachel Spillane, Rachel Maher, Aisling O’Brien, Grace O’Brien, Saoirse Gleeson and the Tipperary under-16 team who defeated Cork on Tuesday last in the Munster final. Well done girls from everyone in the club; a fantastic achievement. Congratulations also to Alanna Morris, Aileen Duggan and the Tipperary under-18 team which defeated Dublin on Sunday last and qualified for the All-Ireland semi-final. Best of luck in the remainder of the competition. 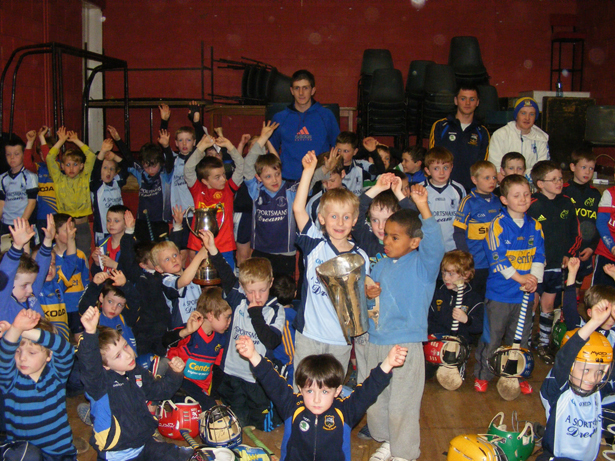 Training for our junior team continues every Wednesday and Friday at 7pm at Nenagh CBS. We are due to play Ballingarry this Sunday morning at 12 noon away in the league. Mentors will be in touch with the details. This is the last week that our new training tops will be available at training for sizes so in order to make sure the correct size is ordered for you please attend. Thanks to Paul Henry and Pinnacle Homes for kindly sponsoring the tops. Best of luck to our under-14s who take on Newport in the Féile na nGael final on Saturday at The Ragg (12 noon). Please come and support this terrific bunch of players. Thanks to everyone who took part in the successful sponsored walk on Sunday last and also to everyone who so generously donated. It is a vital fundraiser for the club and thanks to everyone concerned. A small number of players still need to pay their registration and we that they do so immediately. Our under-16s had a fantastic win over near neighbours Burgess on a score line of 7-9 to 2-4 in the opening round of the championship. What made this win extra special was that this was the first time Éire Óg ever played a championship game at under-16 level in the A grade. Well done girls on achieving a nice piece of history. A deflected Joe Gallagher goal in the fourth minute of injury denied Éire Óg a first round win in the 2013 Hibernian Inn north Tipperary senior hurling championship. A deflected Joe Gallagher goal in the fourth minute of injury denied Éire Óg a first round win in the 2013 Hibernian Inn north Tipperary senior hurling championship. Following a Donnacha Quinn point on the hour Éire Óg led 0-17 to 0-12, but Kildangan converted two late frees before Joe Gallagher’s speculative effort earned Séamus Gleeson’s men a share of the spoils. Points from Michael Heffernan (2), Tommy Heffernan and Kevin Tucker (two, one free) helped Éire Óg into a 0-5 to 0-1 lead during the opening quarter. Kildangan responded in kind and cut the deficit to two points (0-7 to 0-5) before late first half scores from Tommy Heffernan, two Kevin Tucker frees and a monster of a point from Barry Heffernan retired the sides at the break with five between them (0-11 to 0-6). It is worth noting, however, that Éire Óg had conceded a penalty in the 29th minute following a Barry Heffernan foul on Joe Gallagher – Darragh Egan’s subsequent flew narrowly over the bar. Éire Óg, now facing the wind, began the second half in positive fashion and led 0-13 to 0-7 following two Kevin Tucker frees. Kildangan corner-forward Tadhg Gallagher was also shown a straight red card in the 36th minute following a challenge on Barry Heffernan. Three consecutive Kildangan frees reduced the Éire Óg lead significantly (0-13 to 0-10). Efforts from Kevin Tucker, Tommy Heffernan (2) and a Donnacha Quinn point on the hour mark forced Éire Óg into a 0-17 to 0-12 lead entering injury time. In injury time Éire Óg conceded two frees which Kildangan converted before an ambitious Joe Gallagher shot was deflected past Nenagh ‘keeper Michael McNamara. Éire Óg face Moneygall in the second round at Cloughjordan next weekend. Fixture details to be confirmed. Nenagh Éire Óg: Michael McNamara, Mark Flannery, Noel Maloney, John Brennan, Daire Quinn, Barry Heffernan (0-1), Billy Heffernan, Alan Kelly, Pearse Morris, Kevin Tucker (0-8, 0-7 frees), Paddy Murphy, Tommy Heffernan (0-4), Donnacha Quinn (0-2), Michael Heffernan (0-2), Killian Gleeson. Subs: (28th) James Mackey for Killian Gleeson, (50th) Brian Quinn for Paddy Murphy (blood), (58th) Andrew Coffey for Alan Kelly.